The preview is messed up...? gif image not allowed in dA tutorial ?! YOU NEED IMAGE READY, GIF ANIMATOR, OR FLASH TO DO THIS!!! I AM NOT PROVIDING JOO WITH THEMZ!!! The neko in this tutorial looks odd. Any free places where you can do this? Might I suggest also recommending a free online image-editing site where one can edit .GIF files and edit the order and speed of individual frames, as long as the .GIF file in question is 100 frames or less? Such a site people may want to consider checking out is www.lunapic.com for all their .GIF editing needs. May be an old tutorial, but it's quite informative! nd dood i swear that neko in the tut blinked. I SAW IT IT BLINKED SOMEHOW. HOLY CRAP THANK YOU SO MUCH. I WAS SERIOUSLY PARANOID. I STARTED SUPER STARING AT IT WONDERING IF IT WAS GONNA BLINK AGAIN. For flash users at the end when you say time between them do you mean the frame rate or elapsed time? 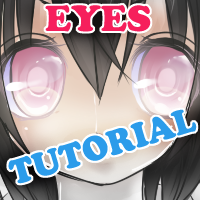 I will see if this tutorial helps me, I will send you the results once I am done with my blinking animation so you can see how much you help, and if it satisfies me I will fave the tutorial. It seems easy though I hope I can pull this off. I might finish today. Here it is, [link] . My first blinking animation, made thanks to your tutorial HatakeSage. i'm using photoshop to start off animating, how long do you think should i set the delay and how long in the animation (obviously depending on the animation) should i have blinking? as long as its noticeable but not HORRIBLY SLOW ahaha~ Have fun with it! [link] Helped with this. :3 Thank you. ; w ; I'm happy someone likes it! Yes! I definitely will.Theres so many things I want to learn how to do with digital art. my game is finished but I cannot share it, sadly! You are a life saver~! thank you!